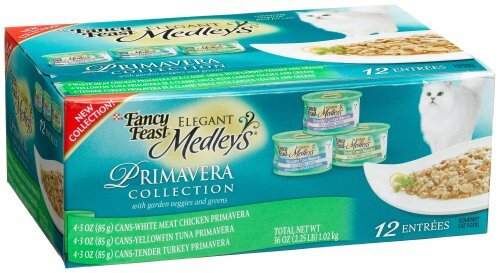 Fancy feast elegant medleys for cats, primavera collection, 3-ounce cans (pack of 24) sets a high standard for cat cuisine. We feature delicious flavor combinations in sophisticated recipes like primavera with classic sauce, garden veggies and greens. The balanced nutrition delivered in gourmet flavors will satisfy even the most discerning feline palates. Convenient, flip top cans make serving your cat's food simple and easy.